If I ruled the world, or at least a publishing company, all books would contain as much supplementary information as possible. Nonfiction, fiction — doesn’t matter. Every work would have an appendix filled with diagrams, background information, digressions and anecdata. And of course, maps. Lots and lots of maps. This predilection probably sprang from the books I read as a kid — books like The Phantom Tollbooth, The Hobbit and The Princesss Bride — all of which feature engaging maps that serve as gateways to imaginary lands. Here, say these maps, you’re in this other world now. As a map: It’s a perfect example of where hand-drawn aesthetics work best in maps — across a small area mapped specifically for visitors, as the exaggerated landmarks are given weight over exacting spatial accuracy. In this way the unfamiliar can be easily spotted and identified. It’s a style commonly seen in attraction maps, like Anika Mottershaw’s Map of London or theme-park maps, like this one of Walt Disney World. The map of the Hundred Acre Wood appears in the first Winnie-the-Pooh book entitled, wait for it, Winnie-the-Pooh. Created by E.H. Shepard (who also illustrated The Wind in The Willows), the map is meant to appear drawn by Christropher Robin, with “Drawn by me and Mr Shepard helpd” written at the bottom and the cardinal directions on the compass marked as P-O-O-H. The storybook woods are based on the actual Five Hundred Acre Wood in Ashdown Forest, near Milne’s country home in Sussex. The original sketch for the map was owned, curiously enough, for a long time by Pat McInally, known in some circles for having the only perfect Wonderlic Test score and also being the first Harvard grad to play in the Super Bowl, which he did for the Cincinnati Bengals in 1981 (zing at you, Ryan Fitzpatick). McInally’s collection, including that preparatory sketch, is currently up for sale at Peter Harrington’s rare book shop in London, yours if you happen to have a spare £115,000 — that’s $182,241.73 — to burn. 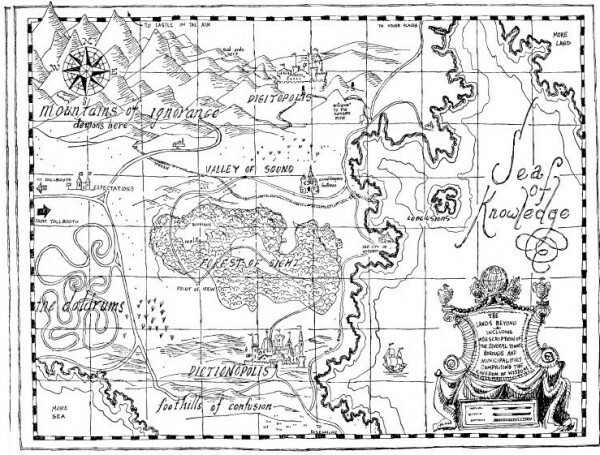 As a map: The key difference between a map like this one and the one from The Phantom Tollbooth is purpose. While Feiffer’s map is intended for exploration, Christopher Robin-E.H. Shepard’s map is a documentation of a known land. In an imaginary world, what’s beyond the borders doesn’t matter so much. Here the only indication of the world beyond is the “To North Pole” note, an obvious sort of landmark for a child’s map. With its focus on the “here” and elision of the “there,” a map of an imaginary world is not unlike early maps, such Hecataeus’ map of the world, drawn in approximately 500 BC, with its amorphous borders of “ocean.” Both Hecataeus and Christopher Robin are making the same point — sure there’s probably other stuff, but this is what’s important. 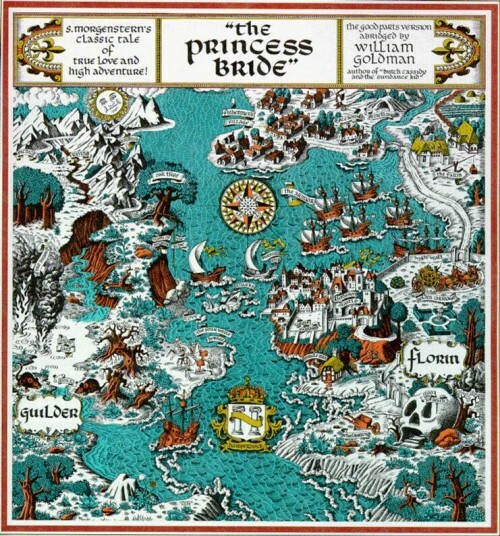 The Floren and Guilder kingdoms described in The Princess Bride are located “between where Germany and Sweden are today.” For any other geographic particulars about the countries, the reader has to consult the map found in the endpapers (in some editions, a fold-out map in the center), drawn by William Goldman (if other illustrators made the map, I haven’t been able to find a reference to them). The map is a doozy — jammed full of details, landmarks, labels, and with no perspective whatsoever. I mean, the Sun is on this map. The trees are the same size as the ships. As a map: The map is deliberately evoking the feel of a Medieval illuminated manuscript, as this is an exaggerated version of how many maps looked around the times of princesses and feudal castles. Though examples of these kingdom-level maps are abundant and accessible, I’d like to particularly draw your attention to collection of sixteenth-century maps of Jerusalem, made available by The Jewish National University Library. The gallery beautifully illustrates the diversity to be found in this type of region-specific map. While none of them include the Sun, like Goldman’s map, they often use multiple perspectives to show the mapped lands. 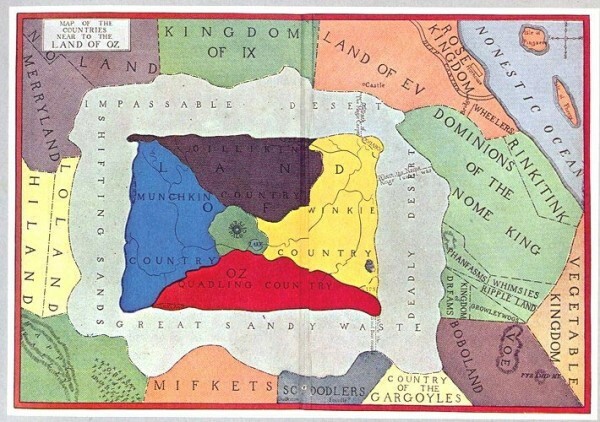 All told, Baum drew forty individual maps of Oz to accompany his novel. This is the major one, though, showing the entirety of the land and its surrounding areas. The Emerald City, in the center, is surrounded by four distinct countries. The countries are bordered by deserts (Great Sandy Waste is the obvious winner here and a great potential new name for the litterbox). Beyond the deserts like a number of intriguing countries that make at best a passing appearance in the story, such as Merryland and the Country of Gargoyles. “Kansas” of course appears nowhere. As a map: A straightforward map if ever there was. One thing to note, though: the compass is reversed, East and West are switched. This is an L. Frank Baum original error! The first copy of this map was on a glass slide, when Baum went to make a paper copy he traced it backwards. It’s a great example of a political map — it’s easy to imagine it as a pulldown over the chalkboards of Oz classrooms. I’d direct you to a political map to look at for comparison, but we all know what those look like. Instead, let’s take a peek at the map drawn for Gregory Maguire’s Wicked. First of all, while there’s no North arrow, the cardinal directions have been corrected from Baum’s original. This map gives a more nuanced view of Oz, complete with a legend and some topographical definition. If the first map was a classroom pulldown, this is the map on the quiz at the end of the chapter on which you have to label all the features. Like The Wizard of Oz, The Hobbit contains many, many maps. 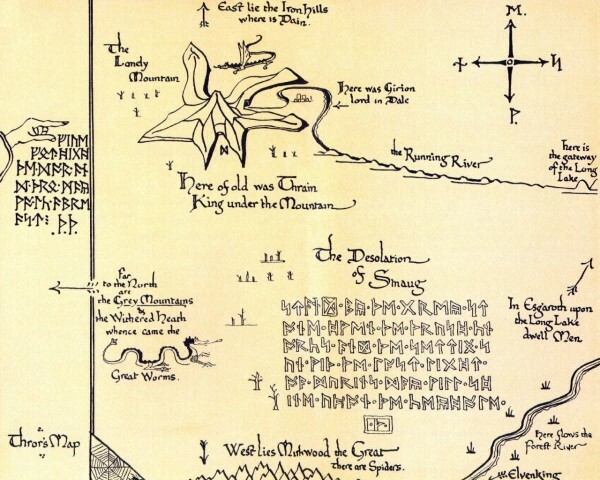 Most of them were drawn by Tolkien’s son, Christopher, but Thror’s Map was drawn by Tolkien himself. In the story, Gandalf gives this map to Bilbo at the beginning of the story, the impetus for our hero’s “unexpected journey” to recover the dwarves’ treasure from Smaug, the dragon of Erebor. As a map: This typographic style of map has become incredibly popular over the past few years, particularly as a way to show a city by its neighborhoods. But a map made completely of words is nothing new. Edwin Morgan’s Chaffinch Map of Scotland, a poem published in 1965, uses the regional variations of names for a common songbird to create a map of his country. Howard Horowitz’s poem “Manhattan,” reproduced here, appeared in The New York Times in 1997. Flickr user amapple has created a small but impressive set of maps focusing on such linear features as the Mississippi River and the Silk Road. Typographic mapping makes an impact even when the words aren’t locations. National Geographic included a type map of US surnames in its February 2011 issue, and an an interactive viewer is available on their website. My last name is everywhere. On a final note, I’ll point out a notable map omission from recent literature: I couldn’t believe The Hunger Games didn’t include a map of Panem!!! This is exactly what I meant when I said that books should have as much supplementary information as possible. 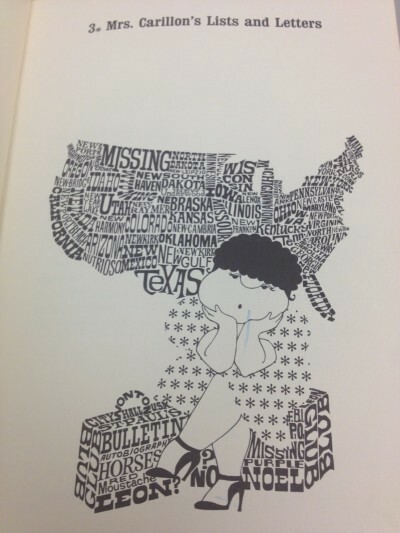 But evidently, there are a lot of us spatial types out there, and an assortment of reader-drawn maps have popped up. My favorite belongs to Livejournal user “aimmyarrowshigh,” who describes the process she used to determine national borders and each district’s location. The result is a spectacular map that would make any cartographer proud. Victoria Johnson is The Awl’s resident cartographer. 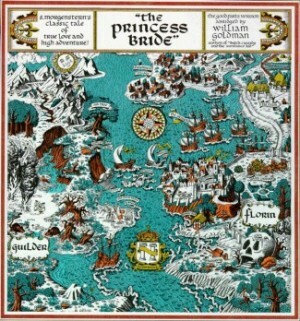 Hobbit and The Princess Bride maps via Woodge.